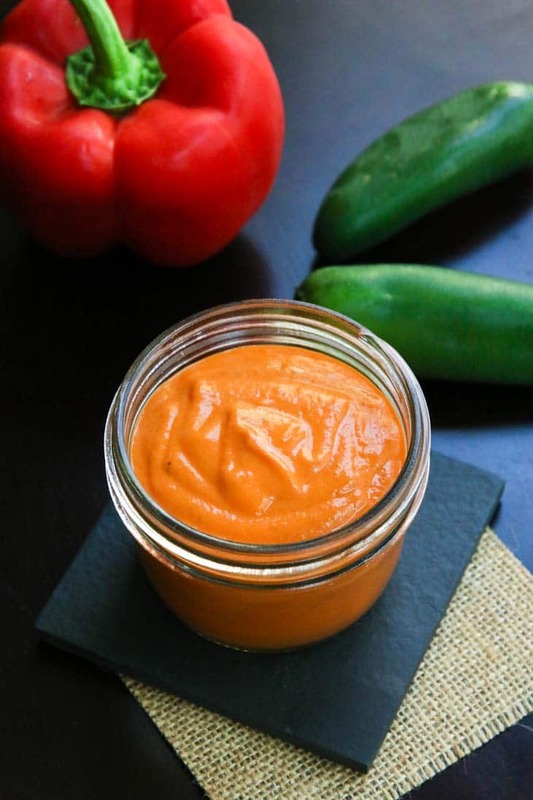 This Spicy Roasted Red Pepper Sauce is the kind that has you licking straight out of a bowl. It’s the star of any dish you use it on be it pasta, with rice, to coat veggies or even as a dipping sauce and it’s so delicious. 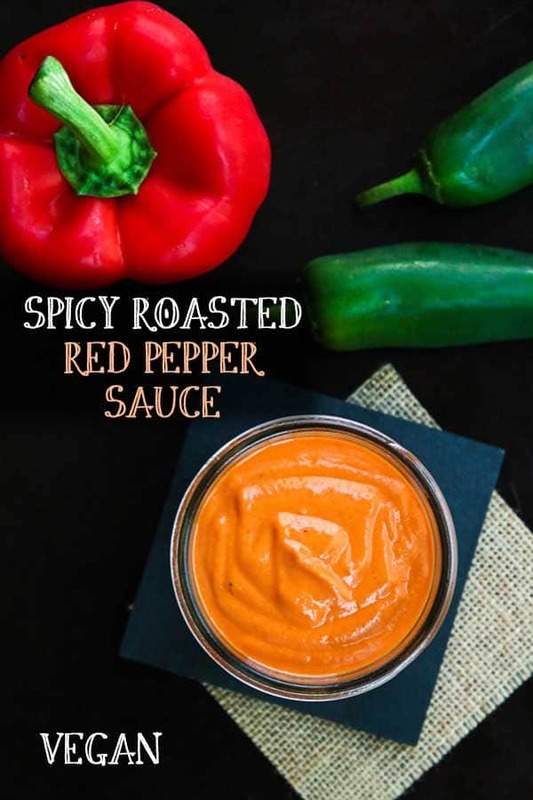 I knew exactly what type of flavor I was going for when I started developing this Spicy Roasted Red Pepper Sauce. It’s the kind of sauce that has you licking it straight out of a bowl. It’s delicious and the star of any dish. Have you ever tasted roasted red bell peppers? I’m not talking about the kind you buy from the store out of the jar. I’m talking about the kind you make at home. This creamy sauce takes about 20 minutes to make, with less than 10 minutes of prep. The rest of the time is spent in the oven and waiting for the skin to soften before you peel the peppers. I took it up a notch and added some jalapenos for some spice, but you can easily omit it or take some of the sauce out before adding in the jalapenos if your kids can’t handle spice (although my 3 year old couldn’t get enough of the spicy version, even though she needed water on the side, ha!). And trust me, you’ll want to make this for your kids. Whatever you drizzle it on, they’ll devour. It’s creamy, rich, and has a beautiful color to it since we typically eat with our eyes first. It also freezes well, though I doubt you’ll have any left-over once you get a taste. Place pepper and jalapeno halves, skin side up, on a foil-lined baking sheet. Flatted the pepper halves with your hand. Tuck the whole peeled garlic cloves under one of the red bell peppers to keep them from burning. 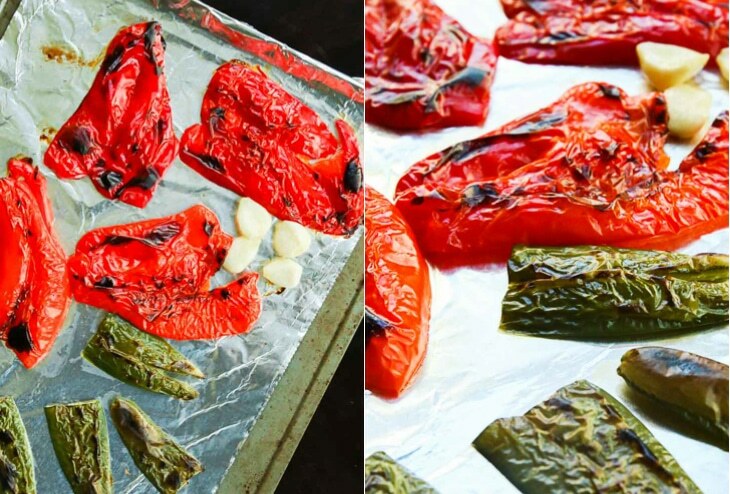 Broil for 10-12 minutes or until the red bell peppers are charred and blackened (just like the photos below). Remove from oven and instantly place only the red bell peppers in a bowl and cover with a kitchen towel to seal. Let it sit for 10 minutes. Once cool, remove and peel the outer skin off. To be honest, I developed this sauce for a taco recipe I’ve been working on (which you will LOVE), but after having it around in my fridge, I’ve drizzled it on nachos, used it as a pizza sauce, sandwich spread, dip for crackers and veggies, flavored some veggie bowls with it, and even poured the last of the sauce over pasta. I am pretty sure you will love this recipe as much as I do. Give it a try…only 20 minutes to make, half of which is time spent in the oven. It is kid friendly, simply take some of the sauce out before blending in the jalapenos. It’s freezable and versatile. 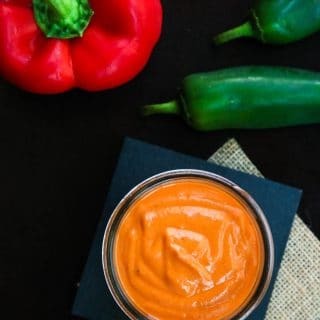 I loved seeing all the ways in which you guys used my other sauces such as my Sweet Jalapeno-Lemon Cream Sauce and Vegan Cucumber Ranch, and I can’t wait to see how you guys will use this Spicy Roasted Red Pepper Sauce! Jalapenos – add more or less jalapenos depending on your level of spice. This sauce will still taste great even if you omit the jalapenos completely. Alternatively, you can simply take some of the sauce out before blending in the jalapenos if you want both versions of the sauce. Cashews – If you are using a powerful blender such as a Vitamix, you do not need to pre-soak the cashews. Just be sure to completely puree into a smooth sauce. Make sure your broiler is on high so you get charred bits on the peppers it gives a lot of flavor to the peppers. This is a delicious creamy 5-ingredient sauce you can drizzle on just about anything! From tacos, to pasta, to using it as a dip! Place pepper and jalapeno halves, skin side up, on a foil-lined baking sheet. Flatted the pepper halves with your hand. Tuck the whole peeled garlic cloves under one of the red bell peppers to keep them from burning. Broil for 10-12 minutes or until the red bell peppers are charred and blackened. Add the roasted red bell peppers, garlic cloves, jalapenos to a blender (I used my Vitamix) along with the remaining ingredients and puree until completely smooth. The exact amount of lemon juice depends on it's acidity, so season to taste with additional salt and/or lemon juice if needed. Store the sauce in an air-tight container in the fridge for a few days or freeze in freezable deli containers and use when needed (see notes below). Use the sauce as a dip, as pizza sauce, spread it on sandwiches, drizzle it over tacos and veggie bowls, or pour it over pasta! Each serving is about 1/2 cup of sauce. Jalapenos - add more or less jalapenos depending on your level of spice. This sauce will still taste great even if you omit the jalapenos completely. Alternatively you can simply take some of the sauce out before blending in the jalapenos if you want both versions of the sauce. Cashews - If you are using a powerful blender such as a Vitamix, you do not need to pre-soak the cashews. Just be sure to completely puree into a smooth sauce. I like adding in the Apple Cider Vinegar but in case you don't have any, additional fresh lemon juice will work just fine. If you're planning on freezing this sauce, you may need to quickly re-blend after defrosting prior to using to smooth out the sauce again. Then you'll love this sauce! It's so easy, has a great kick to it, and the flavor of the roasted red peppers + cashews really goes a long way. This sauce is awesome, the colour and the fact that one can use it on every and anything...BONUS! 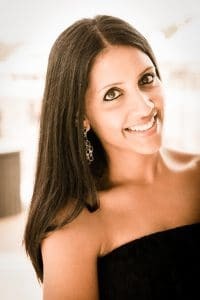 I said this already on Instagram, but HAPPY ANNIVERSARY AGAIN...Wishing you a lifetime of happiness sweet Anjali, glad you had a wonderful getaway. My favourite 3 day getaway would probably be Sun City in Johannesburg, South Africa, there is everything one could possibly need for a break away and not too mention, pool, slides etc, which makes us feel like kids again :-DTo answer your other question, I would probably use this sauce as a dip with crackers and as pizza sauce... Well-Done! Thank you SO much Rashmi!! We did have a much needed amazing getaway! Thanks to family for being able to watch the kids =) Oh I love things that make us feel like kids again...Sun City sounds awesome! Using this sauce on pizza and sandwiches is so delicious! Sorry haven't caught up on all the wonderful commnets you guys have left! I've read every one of them but still need to catch up! This sauce looks amazing Anjali and that rich colour! Wow! Sounds you both has fun and ate lots of delicious food... Hmmm definitely Sun city :) and they also have a lovely breakfast buffet too which we always enjoy :) I would make this sauce, add meatballs alongside some spaghetti...YUMMY! Thank you Reshana!! The color is one of my favorite parts of this sauce, in addition to the taste of course =) Thank you!! Yes...super fun city! I love hearing about other people's favorite 3-day weekend spots! Sun City sounds awesome...need to visit sometime. I also need good food wherever I visit when I'm on a kidless vacation ha! Oh wow!! YES...you need to try roasted bell peppers, especially red, orange, or yellow ones. And you're right everything is better roasted, but red peppers are one of my favorites! Super sweet, and I love using them on so many dishes! This sauce is awesome and I think I've tried to use it on anything and everything! Any excuse to have it in my meals ha! And yes, we had a wonderful much needed trip. It was so nice to get away from everything for awhile and we love exploring new cities, especially ones we can explore by foot =) Great food always helps as well haha. Sounds so good!! I love roasted red peppers. 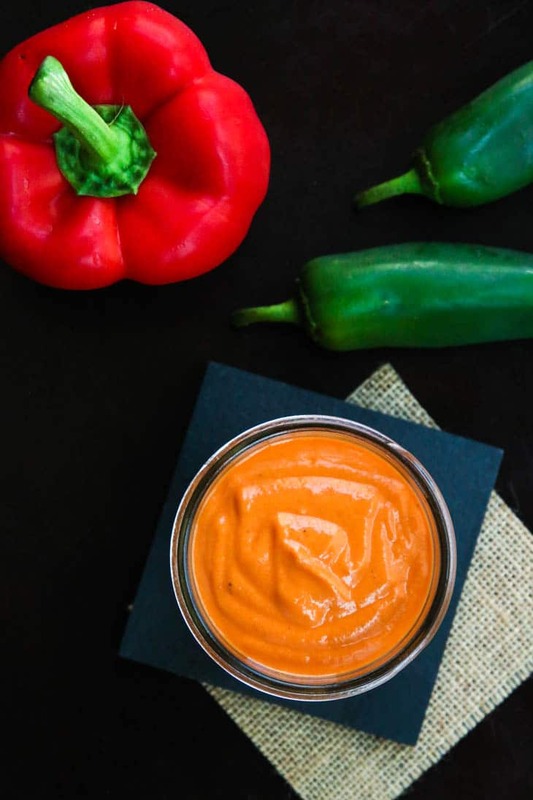 I make a smoky roasted red pepper cashew dip that I literally can't get enough of. This is similar, but with a bit different flavor. I know I would love it too!! Oh your dip sounds awesome Jenn!! Yes...I think I'd love anything with cashews and roasted red peppers in it! The flavors pair so well together! Thank you Mandy!! Years ago I'd always buy the ones in the jar for sandwiches before I realized how easy it was to make your own and of course tasted SO much better! You'll love the taco recipe and this sauce...so simple and it's so delicious! I saw your message, replying soon =) Thank you for the wishes...things have been crazy over in our house and I've been feeling super overwhelmed and tired, so this 4 day trip was much needed and a great get-away. I owe it to my mom and sister-in-law for coming down to watch the kids for us. As much as we love places like Hawaii and relaxing, we've also always had a love of exploring new cities and I love being able to simply walk around everywhere which you don't get here in San Diego. What a beautiful sauce. I just had a great long weekend in Seattle, and loved it. I'm also a big fan of weekends in CA wine country. Thanks Kelly! It was our first time in Seattle, and loved it but hoping to go back! Yes...SF and Napa/Sonoma are our other favs! i cant get over how CREAMY this looks. Thanks Dixya! The roasted red peppers and cashews definitely makes this super creamy and delicious! I love Seattle! We go there often as we live in Victoria BC and there is a direct ferry there. It sounds like you had a wonderful time and the sauce looks totally delicious! It would be perfect on my Buddha Bowls! Yes! Loved your buddha bowls and this sauce would go perfect! We LOVED Seattle...luckily it's not too far of a plane ride away so we'll definitely be coming back. Loved all the vegan finds there too! So good! Oh my goodness, DROOLING over this! YUM. 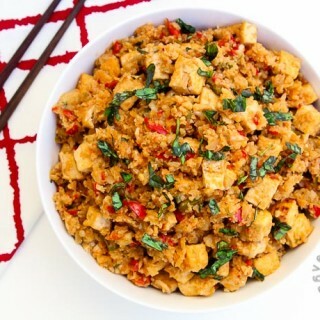 This is recipe is simple and flavorful. I liked this because we can use this sauce for so many things like you said. Awesome Anjali! Thank you Uma! Sauces you can use on many things are the best! Oh yay!! You came to my city! I am so happy Seattle behaved with good weather for you guys. Happy Anniversary! Oh that's awesome you live in Seattle! Yes...we both visited portland two years ago and loved it so knew we'd love exploring Seattle as well. We planned it assuming we were going to get rain, so when it was beautiful, clear, and sunny out it we were surprised! It only rained for 1/2 a day, which was actually quite refreshing =) Great city...where do you live there? Roasted Bell Peppers? I'm in! My mate Dave recently has been obsessed with roasted bell pepper sauce. I forwarded him your recipe to try out :D Thanks for sharing! Thanks Hauke! Roasted bell peppers are the best! So cool you guys vacationed in Seattle! I used to live there. If you're there and in the mood for pizza Pizza Pi is near the university, totally vegan and _awesome_. But there's so much vegan to choose from in Seattle, it's hard to pick a place. I love roasted peppers and need this sauce in my life, on a big bed of pasta! Thanks Gin! I will definitely put Pizza Pi on the list to try next time! And yes, loved exploring all the vegan finds there! Seems like a wonderful place to live, although I'm pretty set on SD for the time being =) This sauce is awesome you will love it! I tried this recipe to add to the condiment options for veggie burgers. It was a huge hit at our 4th of July barbecue. It was also very easy to make. Lots of flavor and just the right amount of spice. I have already made it twice since then. Thanks so much. Also my brother attended your session at YJA and really enjoyed it. Hope you're well. This sauce is amazing! The color is beautiful and the taste is every bit as versatile as you said. I only used one jalapeno because I was using for company, but will use two next time as we like things with kick. Really delicious. Used it to make homemade tamales, but will also use as a pasta sauces and just a general sauce. Thank you. That's so great to hear Sara!!! I have yet to post a few more recipes using this Sauce!! And homemade tamales sounds wonderful...it's been on my list of things to make for awhile now. I can see how this Sauce would go perfectly with them!! We LOVE this! Making another batch tonight to dress roasted and stuffed poblano peppers!Thank you!!! Thank you Jasmine!! Great to hear! This sauce would go so well over roasted & stuffed poblano peppers...need to try that sometime. I have another recipe coming soon using this sauce! Thanks again! This sounds amazing! Is there a substitute for the cashews? My son is allergic to nuts, so would maybe roasted sunflower seeds or pumpkin seeds work in the same way? Thank you! I personally haven't tried any other substitutde, but there definitely are non-cashew subs you could try! I'd probably go with boiled or roasted pumpkin seeds (not salted) first since they are slightly on the sweet side similar to cashews in that sense. That should work well! A second option would be to maybe add some corn starch (as a thickener) and then reduce the sauce over the stove but you may need to add a few additional things to adjust the flavor in that case. I'd totally try the pumpkin seeds! I think it'll still taste great! Let me know! thank you so much, my son and I are allergic to tomatoes so this sauce is great, we have missed red pastas so much. So great to hear! 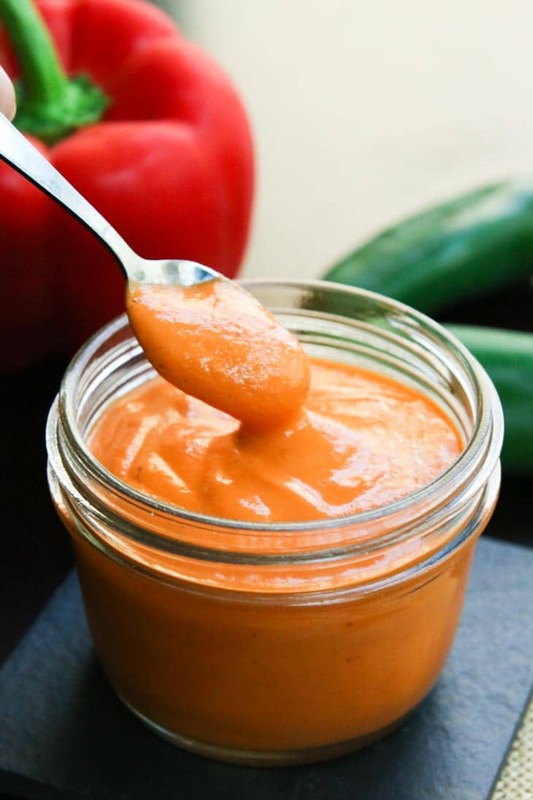 Yes...this roasted red pepper sauce is so delicious! 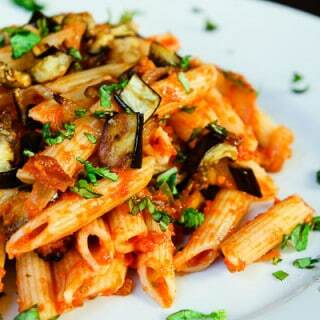 I'm coming out with another roasted red pepper pasta sauce soon! I'll try to keep in mind and have a tomato free version depending on what I create! Hi! Very nice recipe, was wondering if it could be used as a pizza sauce instead of the regular tomato-based sauces..? Absolutely! This sauce can be used for so many different things! Pizza sauce is a great idea!